Had to share my impromptu design for our honey jar labels. I want to get them labeled for this weekend. There’s a village peddler’s day this weekend and I’m going to whore my wares in the center of town; selling honey alongside my old lawn mower and any trash to treasure stuff I can find in the basement or garage. “bee” is our brand 🙂 I don’t know if anyone else is using that, but I’ll keep using it until someone tries to stop me (I generally always get what I want). I drew the wildflowers using a photo I took earlier this year of flowers on our land. I don’t know what they are but they are yellow with red centers. There’s a photo on the blog somewhere. The copy font is avant grade which is one of my all-time favorite fonts. The font choice, along with my black and white trace drawing kind of gives the label a retro 70’s vibe which I like a lot as a child of that decade (and the one after). We grew up in a classic 70’s house and they type of architecture is prevalent throughout the valley in which we live if you know where to look. Available in 8oz and 4oz glass bottles, 100% of the proceeds from our honey sales go towards educating our kids, paying for our eco-friendly house, buying wildflowers and trees, and supporting our bees. 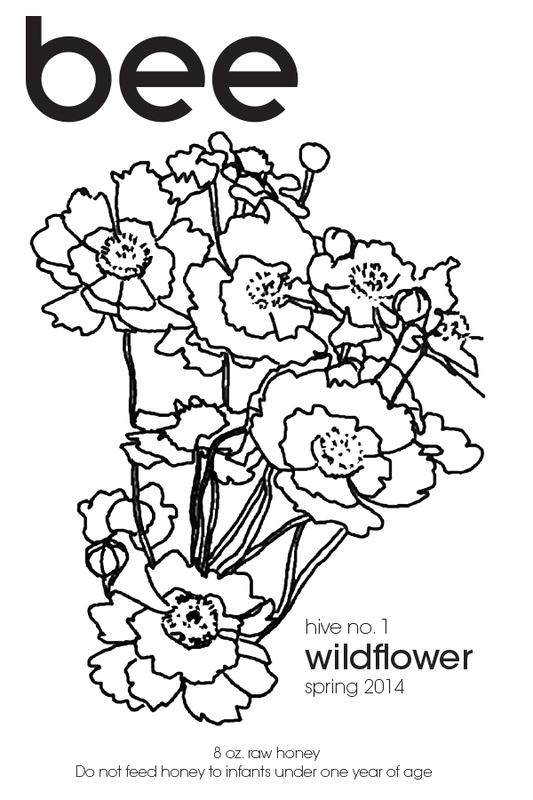 Label for our “bee” brand honey – includes hive, season and type information. This entry was posted in Bees, Saving The World and tagged art, bee brand honey, bees, cool, design, graphic design, honey bottle label, illustration, land, ohio, retail, selling, wildflower honey by Chris. Bookmark the permalink.